Inspired by our recent feature on make-up brushes to update your kit? Here’s our recommendations on what to get! 1- 3: Charlotte Tilbury brushes are the gold standard of makeup brushes. More expensive than most on the market, they’ve been designed by the makeup artist herself and so consider the angles, shapes, fibres etc. that’ll give you the smoothest, easiest and most luxurious application. Each brush has been ergonomically designed for ease of use and to ensure they don’t roll of your dresser. We personally recommend the Powder and Sculpt brush (£35) Foundation Brush (£30) and the Bronzer Brush (£60). Using the bronzer brush, buff your bronzer all over for a natural sun-kissed look. The Powder and Sculpt brush is the brush for definition- highlight those cheekbones, and add definition to lips and contour your nose. 4-5 I always stock a brush or two from The Body Shop. Their brushes are fantastic for precision and they’re super soft- allowing your to create flawless looks without wreaking havoc on your skin. In particular, the eyeshadow brush (£10) and slanted brush (£9) are essential for every makeup kit, especially if eyes are your thing. The blender brush is essential for the smokey look or even just layering your eyeshadow in general. Use this brush to ensure smooth transition of colours without leaving lines! Use the slanted brush with a pencil eyeliner for a more edgy, smoky look. Also perfect for getting product to work seamlessly through the eye crease! 6-8 ZOEVA brushes are extremely soft and majorly cost effective. The powder brush (£14.80) in particular is an essential makeup tool if you’re a powder wearer- blending product on your face for that smooth, flawless, natural look. 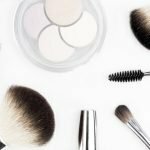 We highly recommend taking a look at our brushes feature for their professional top tips on caring for and how to use your makeup brushes. The highlighter (£14.80) in particular is brilliant- you’ll be able to create high definition cheekbones with this brush as the brush itself allows for great precision. The smoky shader (£9.50), because of it’s perfect roundness and fewer bristles than most, allow you to create perfectly controlled and defined smoky eyes. You’ll no longer need to be envious of the Instagram eye pics, yours are worthy too! Number 9: Bare Minerals Flawless Application Brush (£24). If you work with loose mineral foundation then this is an essential for you. It has varying heights to it’s bristles which allows you to work the product in flawlessly to the skin allowing for full coverage and a smooth and natural finish.